In Japanese history, there were only ever eight empresses, and Empress Jitou was the third. When I say empress though, they were only ever regents, people in power until a suitable emperor was chosen, or grown-up, because Imperial Japan follows male succession. Following that vein, Kagu Mountain is the mountain of a stone door behind which resides the Sun goddess, whom, in Japanese religion, bore the first Japanese emperor. Which means that all Japanese royalty are descended from gods, supposedly. 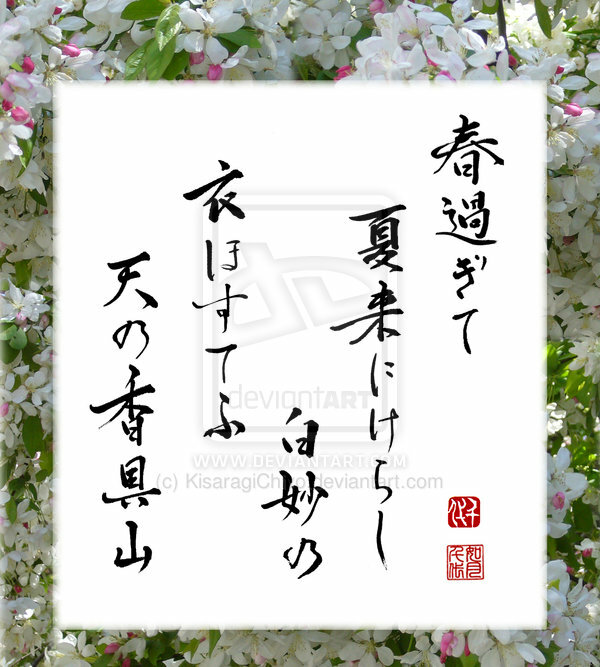 In the poem, my translation notes says that the speaker merely realises that spring has passed before they knew it with the mention of drying summer robes, and Mount Kagu is there to give the poem imperial symbolism, and as a hint that the poem is about succession. I agree about the succession, and the fact that it is written by one of rare female empresses means, to me at least, that the poem is about what the Empress Jitou feels about passing on her rule. The passing of Spring – the promise of new beginnings and refreshing – and the beginning of Summer – strong with the pulse and energy of life – means that she is either realising that she was only there like Spring to pave the way for the ‘true’ emperor, the Summer, or that her reign has already entered its peak and she will soon have to abdicate her rule to the following emperor. In any case, I feel that, despite the brightness and vivaciousness of Summer, Empress Jitou is feeling nostalgic for the power that she only temporarily has, and that looking onto the bright summer robes drying in the sun has woken her to the inevitability of the passing of time. However, it also gives off a sense of purpose and of hope, that she is here to prepare the way, and that her work during her rule will be fundamental in maintaining a strong Japan and will stay as a guide for her successor. And who hasn’t felt like this before? Feeling the inevitability of moving on… losing the powers of being in the highest grade as you graduate from primary school, losing a sense of innocence and being a child as you graduate from high school, losing a sense of freedom as you graduate from whatever and enter the work force… we may not ever lose the powers to rule a country, but every time we move on from one stage of life into the next, the same sense of helpless nostalgia for lost times and the hope that we have for the future is and will, I believe, remain the same.